I’VE SEEN THIS PLACE BEFORE. I just know I have. On my vintage Candy Land board game. Or in a fairy tale perhaps. The seasonal Dairyland Drive In opened in 1955. Although I did not ask, I believe the area to the left is the original drive-in, now used for storage and patio dining. But I haven’t really. 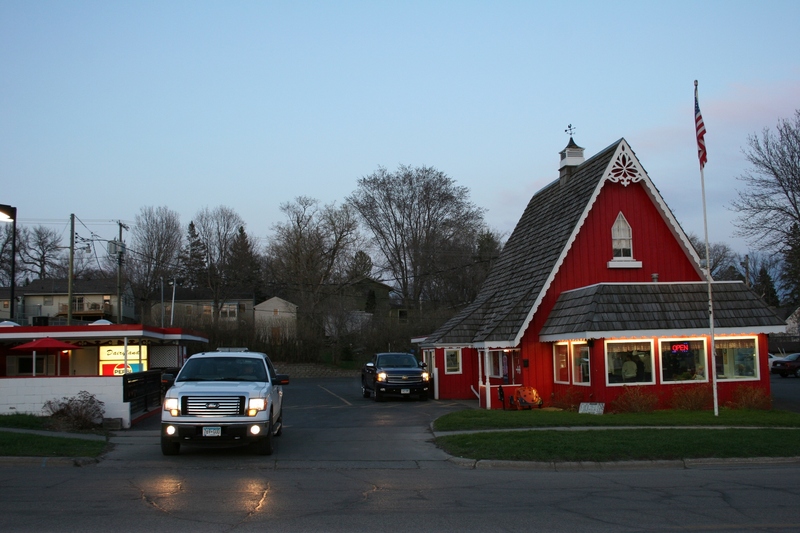 Not until this glorious spring evening have I laid eyes on the Dairyland Drive In in Fergus Falls. Now, here I am, photographing this longtime fast food place in the photographer’s golden hour, thrilling in the pop of red against pink-tinged sky, the flash of headlights signaling the end of a Thursday in this west central Minnesota community. 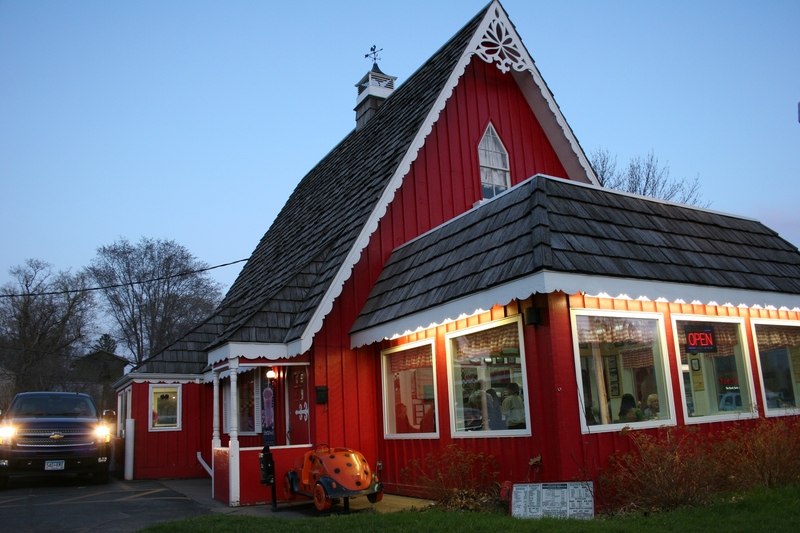 If I had even a smidgen of space in my tummy for an ice cream treat, I’d be waiting in line at Dairyland for a hot fudge sundae. But my husband and I have just finished a filling meal of sandwiches and fries at Mabel Murphy’s, across Interstate 94, before touring the town. We are not one bit hungry. Too bad. 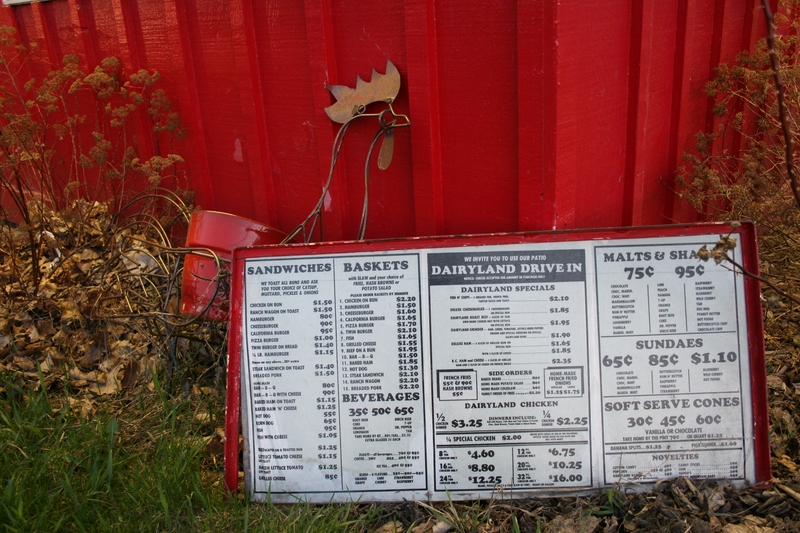 A vintage menu is propped outside the restaurant. 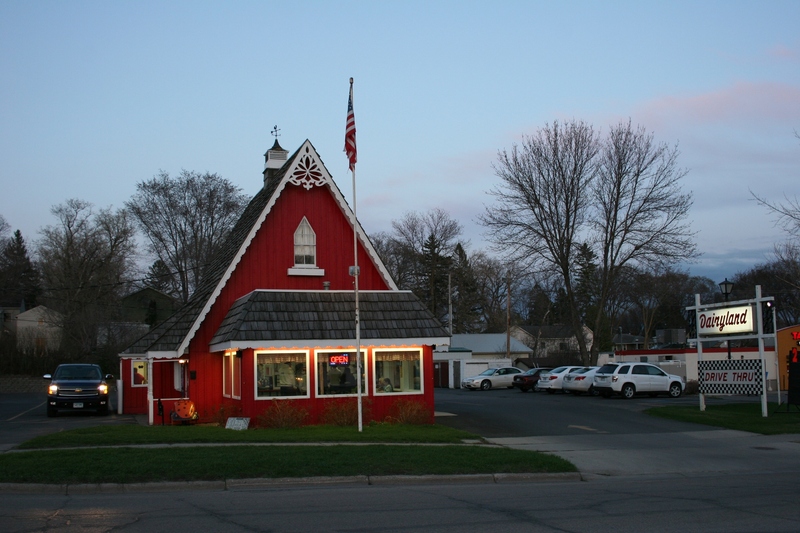 So on this visit to Fergus Falls, I must content myself with photographing that sweet gingerbread style building which houses Dairyland, established here in 1955 and now in its 58th year of business. Soon co-owner Pat Connelly notices me and walks across the street. He first worked at Dairyland at age fourteen, when he started with slicing onions. He and his wife, Jean, bought the place in 1997 from his brother, Chuck, who bought the business in 1982 from Bert Skogmo. Up until 2001, Dairyland still had car hops. Now it’s drive-through or dining inside or on the patio. Just another view of Dairyland, with the parking lot to the right. The eatery is still known for its homemade onion rings and for broasted chicken, Pat tells me. Sandwiches are named after locals and those who worked here. Like the K.C. Ham & Cheese after Kelly Chandler. Or the Borstad Burger. Pat seems especially proud of all the local teens he’s employed—500-plus through the years. When an elementary-aged girl walks by Dairyland, he greets her, tells me she will be coming with Mrs. Johnson’s class on an end-of-the-year class outing for treats. That’s tradition for most Fergus Falls students. I can’t help but wonder at the memories they’ll cherish of Dairyland… and pass along someday to the next generation. 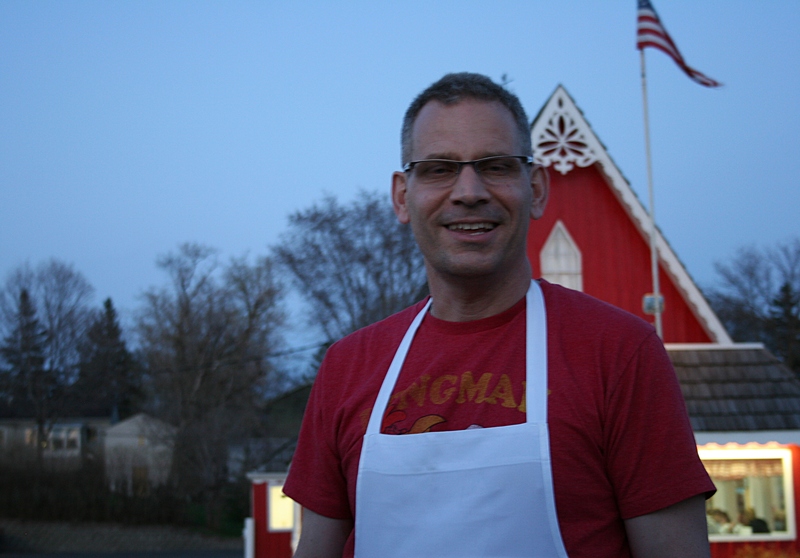 HAVE YOU EATEN at Dairyland Drive In in Fergus Falls? If so, let’s hear your thoughts. If not, tell us about a similar old-fashioned drive-in you’d recommend. Note that my husband and I were in Fergus Falls in mid May, when these photos were taken and I met Pat Connelly. I LOVE this post!!!! The closest I can get to such an establishment is Lakeview Drive Inn (Winona) http://www.lakeviewdriveinn.com/index.html and Rudy’s (LaX) http://www.rudysdrivein.com/ . Both have car hops. Rudy’s are on roller skates! Great food. Lakeview makes their own root beer….awesome!!!!! BUT…..your drive-in’s building is wonderful!!! Terrific post! Ah, yes, the Lakeview. I’ve been there several times (the eldest attended Winona State) and even wrote a magazine feature about this drive-in. I agree about the root beer. The best. I was not aware of Rudy’s in La Crosse. Too bad as the second daughter attended UWL. Thanks for the tips on that one, Doreen. You’re very welcome. And, again, you know you can “count on” me for more ‘food places’ to check out!!!!!! Ha, ha. Know of any good eateries in the Luverne area? We hope to visit Blue Mounds State Park this summer. Never been to that park and always wanted to go there. Sounds like you are in for a fun fabric shopping day. Yeah…..but will try to hold back as my stash is really enough for several lifetimes!!!!! Now that’s a funny comment. I assume that little root beer stand where you drank gallons of root beer and learned to cook is long gone. I love discovering charming grassroots places like this. You’re right: They are treasures. I’m with you. I totally wish I had been hungry enough to purchase some food here when we happened upon the Dairyland Drive In. What a neat stop you found on your travels. I will add that to my list of places that we need to try out when we travel that area. Another great drive in that has car hops all summer is the one on the edge of Winthrop. They have a great variety of food. But beware, they close down on Labor Day weekend for the season. They are getting harder to find – those drive-ins. BTW, I saw an ad in the Henderson Independent – they are looking for a reporter!! I noticed that drive-in in Winthrop AFTER we drove past it about a month ago while returning on the back roads from Fargo. Why have I never noticed this drive-in before? I used to live in Gaylord and drove Minnesota 19 all the time. Good grief. I saw the ad, too, for a reporter. No, thanks. Not only are their ice cream treats great but the Ham and Cheese and Onion Rings are the best around. I remember going here a lot growing up and wish I could package it up to take with me. Miss it lots. Maybe next time you find yourself too full for Dairyland you should try jumping up and down to make some space as it is totally worth it! Great post, thank you. Oh, Mike, I love your sense of humor (advice). I should have remembered what my husband always says about ice cream. It doesn’t fill you up, it just melts and fills in the cracks. Thanks for your personal five-star review of Dairyland. I would give Dairyland a 10 star review if there was such a thing. Thanks for your “review,” Mike. love these type of places. Little gems they are! You’re right on that. Readers, check out Dan’s photography. I promise. You will love his images. Oh, yes, you must. Sounds like an idyllic place. Thanks for sharing your memories, Lee. I have been eating at Dairyland since my mother was bringing me there in 1955! Now living in Silicon Valley, so not as often, but we make sure we get there whenever we visit. My red Model “A” Ford could often be seen there through high school in the early 60’s and through 1965 when I went off to the U to finish college. Still driving the same red Model A in CA – where we have nothing like Dairyland! Thanks for sharing your memories of Dairyland. Places like these are to be treasured in rural America. I remember hurrying to get to Dairyland before they closed at Midnight when I got off work at 11:00 PM at the Otter Tail Power Co. garage on a weekend night – to get a Malt served by a friend at the window. There was no dining area at that time, so today’s serving window was outside the building! Also, it was painted a soft pink instead of red for many years. I still am getting used to the red, but think it looks good, too. I grew up on a farm about 15 miles west of town, so it was a long trip in a 30+ year old car if Dairyland was the only destination. But, cruising back and forth between Dairyland and the A&W on the south end of town with a carload of friends after leaving the HS football game made the trip worthwhile. One headlight would flicker: when that happened last week I thought of Dairyland 50 years ago! What absolutely great memories you have of Dairyland, Phil. I love hearing these types of stories from readers.